Beginning this March, a series of events will mark the 50th anniversary of agricultural cooperation between Yamanashi Prefecture, Japan and Iowa (for some of these, see the Partners in Agriculture website). 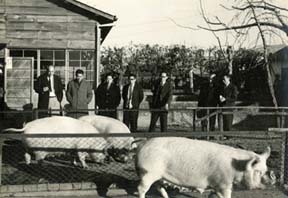 2010 marks the 50th anniversary of the Iowa hog lift (see below for more), the establishment of the Iowa-Yamanashi sister state relationship and the founding of the U.S. Grains Council. The pigs arrive at Tokyo International Airport. In 1959 Yamanashi prefecture had experienced two typhoons in less than a month, devastating agricultural production in the region. An Iowan working in public relations for the U.S. Air Force in Tokyo, Master Sergeant Richard Thomas, thought that sending pigs from Iowa to the prefecture might help the agricultural industry in the area. Sergeant Thomas’ idea came to fruition in January 1960 when 36 meat breeding hogs (one died along the way), donated by Iowa farmers, were flown to Japan on a plane provided by the U.S. Air Force. Sergeant Thomas viewing the pigs he helped bring to Japan. The Special Collections Department is lucky to hold the papers of one of the participants in the hog lift event, Walter Goeppinger, then president of the newly created National Corn Growers Association. Goeppinger was an important supporter and chairman of the project. His collection (RS 21/7/34) contains a scrapbook given to him by the Yamanashi Governor, Hisashi Amano. 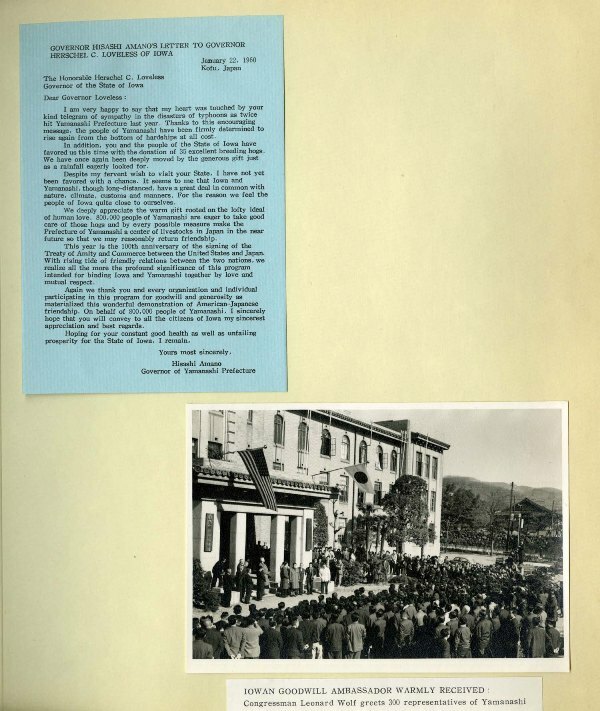 The scrapbook includes photographs of the prefecture before the typhoons, damages from the flooding, celebrations of the hog lift, and images of the pigs in Yamanashi. The collection also contains materials from Walter Goeppinger’s time as president of the National Corn Growers Association. Included is the Association’s newsletter, National Corn Letter. When paging through these newsletters, one can find brief articles which document the relationship between the Association and Japan, brought about in large part as a result of the hog lift. To the left is the first page of the scrapbook given to Walter Goeppinger by Yamanashi’s Governor Amano. At the top left is a copy of the letter written to Iowa’s Governor Loveless from Governor Amano. In it, Governor Amano thanks Governor Loveless and the people of Iowa for their generosity after Yamanashi’s typhoons and the devastating floods which followed. The photograph is of the Prefecture Building and the gathering of Yamanashi representatives to greet Iowa’s Goodwill Ambassador. For a more complete description of Walter W. Goeppinger’s Papers, please visit the online finding aid, RS 21/7/34. 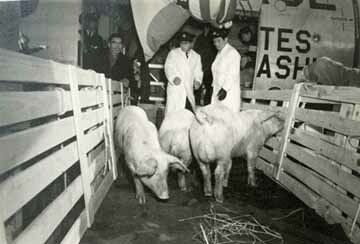 This entry was posted in University Archives and tagged Agriculture, hog lift, Iowa Sister States, scrapbooks. Bookmark the permalink.